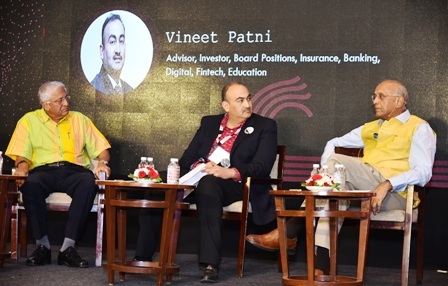 Pune 12 April 2019 : In an era where success rate of start ups is still low , Ideas and Talent will play and important role opined experts . The Indus Entrepreneurs , a Not for profit making organisation organised the seventh edition of TiECON , a unique two day initiative for start ups at The Westin Hotel Koregaon Park . More than 500 start ups from across India took part in the event . Narayanan who has been deeply involved in start ups said that while the success rate in start ups is still low and the start up industry has to yet take off we should not be judgemental. Just like a baby tries to walk and falls down to get up again and in the process learns to walk , similarly we should not stress start ups what not to do , instead they should be given a free hand. Gopal krishnan said that start up is like a new baby born and one has to nuture it . The good thing is that they are young and have no boundaries and fear and then only thing they see is success and there is a learning process in free wheeling environment. Talking about ideas Paani Foundation Satyajit Bhatkal CEO Paani Foundation said that the water cup revolution started during the Satyameya Jayate series and we came across a startling fact that there is no problem in India which has not been solved but the solution has restricted to a specific area or village and has not converted into mass movement . So we have the know how but no scale and i think communication is the missing link between these two . We came up with the idea of Water Cup which is a competition and is fun , modern and participative. It adds to the excitement of participating and also gives an opportunity of sharing knowledge . We shut down Satyamav Jayate and concentrated on one issue and that is of water and in a state of Maharashtra which already was a laboratory of techniques to fight endemic droughts , but this was confined to only few talukas. There is a need to convert this into a mass movement to transform the face of the entire landscape. Kiran Rao said that I am a city girl and my idea of village came from paintings , film shoots and didn’t really get a chance to know more about them . Going to villages changed my perspective about my own life . At deeper level something had changed and felt more connected with people and in a sense a bright new world and connected to the vast nature. It was incredibly transformative and fulfilling for me .It has been incredibly fun to do . It connected me to nature and it made me realize how far we have gone to destruct nature . This gave me a chance to step up to help conserve our nature . It is a joyous celebration . The Jalmitra initiative which we have started was to bridge the gap between village and the city . This is bringing about a transformation where an entire community is working with a common goal . The electrifying theme of the event is second wave with many industry experts . TiECon Pune 2019 is redefining the way entrepreneurial conferences are run promising a unique experience which will be Knowledge Driven and High Energy. TiECON Pune is spread across 2 days, with the first day being devoted to ‘8 masterclasses’ for the young entrepreneur. Kiran Deshpande, Co-Founder – Mojo Networks & President of TiE Pune said “Start-ups bring in focus, speed and innovation in their offering that are often missing in established businesses. India and Pune are emerging as one of top three start up hubs globally, prompting a global giant like NTT Data to participate with TiE-Pune for scouting global entrepreneurial talent. TiECON Pune 2019 shall showcase the very best effort in fostering entrepreneurship”.